"A great fund of comic invention." - "Times Literary Supplement" "Written with great spirit . . . very funny . . . fresh, unhackneyed and excellently observed." - "Listener" "[A] bustling kaleidoscope of a book, by an author fertile in expedient, keenly observant and occasionally probing the heart of darkness." - "Sunday Times" Charles Lumley feels that he has been born in captivity - the captivity of his smugly conventional bourgeois upbringing. Now he has just graduated from university, only to make the discouraging discovery that his education has rendered him unfit for any kind of useful employment. Wondering what to do with the rest of his life and longing to escape, a chance remark overheard in a pub sets him off on a picaresque and hilarious tour of 1950s Britain. He undergoes a string of comic misadventures as he works as a window cleaner, a drug trafficker, a hospital orderly, and a chauffeur, all while trying to find his place in the world and win the love of the beautiful Veronica Roderick. 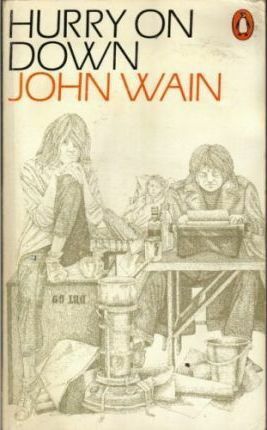 John Wain (1925-1994) was one of the great English men of letters of the 20th century, a prolific novelist, poet, biographer, and critic whose many accolades included the Somerset Maugham Award, the James Tait Black Memorial Prize, and the Whitbread Award. "Hurry on Down" (1953), his first novel, ushered in a new kind of English novel and paved the way for many later classics, including Kingsley Amis's "Lucky Jim" (1954) and John Braine's "Room at the Top" (1957). This 60th anniversary edition includes an introduction by Nick Bentley and marks the novel's first republication in the United States in more than half a century.